Context: An awareness is emerging that effective marketing campaigns must establish trust much earlier in the game. The assumption, "It must be true or they couldn't say it," has been eroded to "Everyone just says what they think I want to hear." To be credible these days, you have to start by hooking into credible sources and present a message whose truth is easily verified. The Diving Board: In a recent presentation, public relations strategist Elizabeth Albrycht emphasized how corporations have to find new ways to convey goodwill toward their customers and demonstrate their trustworthiness. What I am proposing is a different way of practicing communications, which can transform it into a tool for consumer or citizen decision making. This type of decision making is not based not on one source or reputation, but is rather a product of many sources, a triangulation, if you will, of positions. Next? How do the messages you're putting out fit in with what the audience is doing and hearing? Do you reference other resources or tell a story they can verify easily? Why: To get people's attention, it used to be enough to entertain or inform them. Competition among the messages has destroyed the return on that investment. Now you have to generate a conversation. Context: Direct response marketing has always judged its success by the amoung of response, preferably in the form of purchases, it generates. Advertising for awareness was much more common, but now it's dying. Consumers can't afford to be aware of things they don't need, and advertisers can't afford to waste time speaking to them. The Diving Board: Two valuable articles have recently been published. "Content is just a means to an end, so there's something to talk about," he said. In other words, social connection trumps all. On research and development: How and Where to Listen to Customers in iMedia Connection, May-23-06, by Laurent Flores of Brand Delphi. Do you let your contacts know how to reply? How have you enabled your listening post? Why? Getting closer to your audience requires you to see them as individuals. Learning more details helps you break down dangerous generalizations you may be making about them. Context Online networking tools have evolved past the glorified rolodex to places where you can research people, companies, and trends. You'd be surprised at how much information can be had for free or very little commitment. LinkedIn is designed to get people to start working their connections. Very well designed and growing. Jigsaw is an innovative service targeted to people who want to swap information. Looks promising. Spoke helps companies apply knowledge management tools to leverage who their employees know. ZoomInfo seems geared to recruitment, but also offers powerful tools for profiling someone's web presence, including you own. Plaxo really IS the automated rolodex. Be careful that you don't substitute its convenience for acutally maintaining your network on a human level. I no longer accept Plaxo update requests from people who don't return my emails or phone calls. iProfile, Hoovers, and CI Radar are tools for researching companies. If you subscribe, these services will supply you with contacts at the companies you're tracking. Next? Have you browsed your contact list recently and zoomed to learn more about a couple of audience members? Did you learn something that surprised you? When entering a new market, it can take a long time to build up an audience who will give you reliable feedback about your new product. Now P&G is selling a business service that will provide an audience who's already predisposed to talk and talk back. Instead of focus groups and surveys, can you find a community that wants to become the "lead users" of your product? Although it's not very readable, on the left is Amazon's recommendation page for me. Instead of browsing the bookstore, I can select and tune how I get my recommendations. I don't see the big fancy display at the front of the local bookstore at all. As the number of media choices explodes, members of the audience have to manage their attention. Jason Fry, a Wall Street Journal columnist, does a good job of analyzing how he trades off choices and reducing the amount of time he spends browsing. Interruption marketing becomes less and less available, and persuading people to give permission to send marketing messages will become more challenging in the future. How can you become a preferred provider of information? I can think of two ways: quality and connections. Can you think of others? The truth is, I don't miss serendipity. As with a lot of things, our memories are rather selective, remembering the occasional entertaining show we found channel-surfing but forgetting the hours upon hours we spent cycling through the channels while our significant others grew homicidal. Generating referrals can be very challenging, especially if you ask people to share at the wrong moment, or ask too often. At ClickZ, Pete Blackshaw recommends that every business examine their customer experience to find the "ex-spot" or point at which the customer is most likely to share. Ex-spot experiences, as Pete describes them below, probably fall into a limited number of catgories, such as annual events and newly discovered bargains peopel want to pass along. Do you think ex-spot experiences are relatively predictable or unexpected and unique? The ex-spot is that critical moment of experience that makes feedback and word of mouth slide off your tongue like kids on a waterslide. It is always well-timed; piggybacks on the great things we love about products, services, and brands; and is never -- I repeat, never -- forced. A big reason so many marketers fail in word-of-mouth marketing programs is they embark on programs well outside the ex-spot. They push messages that are out of context with the actual customer or brand experience. For even more information about why people do and don't share, look at this iMedia Connection article by Joseph Carrabis, Why Some Viral Marketing Doesn't Work, May 5, 2006. Are Advertisers changing from Producers to Sponsors to Art Galleries? As the traditional media outlets such as TV networks and newspapers are becoming less effective advertising channels, advertisers are trying two different paths to their audience: 1. Generate their own content, such as Proctor & Gamble's Home Made Simple, and 2. Find artists who are compatible with the brand and sponsor them. Which will become more efficient and commonplace? At iMedia Connection, Noah Brier and Drew Neisser of Renegade Marketing Group say that as in the early days of TV and radio, companies will eventually stop producing content, which isn't a core activity of their business, and switch to sponsorship. Brier and Neisser also say this will be a boon to all the emerging young artists who currently post their content for free on sites such as MySpace. They may be right. A new business called Revver has been launched to help amateurs earn money from traffic to popular videos. Does this mean that sponsors will become the tastemakers, as in the old days when artists had to find a patron to be successful? 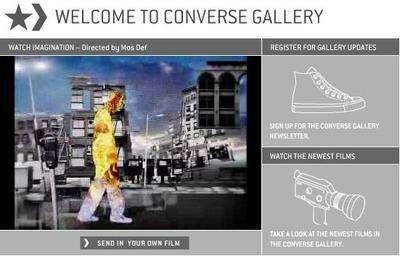 Is the Converse Gallery an art gallery of the future?